The National Center for Tumor Diseases – NCT Heidelberg was founded as an exceptional alliance between the German Cancer Research Center (DKFZ), Heidelberg University Hospital (UKHD), the Heidelberg Medical Faculty, and German Cancer Aid (Deutsche Krebshilfe). NCT Heidelberg has implemented a Precision Oncology Program (NCT POP) as a center-wide master strategy. NCT POP focuses all translational activities towards individualized cancer medicine, including patient-oriented strategies in genomics, proteomics, immunology, radiooncology, prevention, and early clinical development. 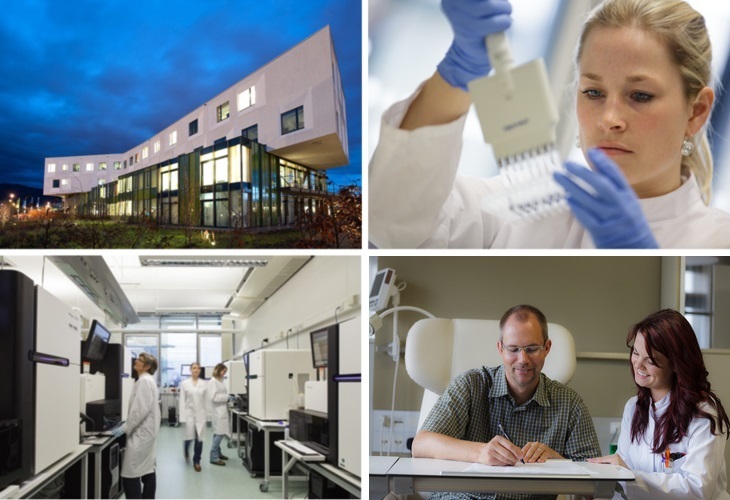 To this end, DKFZ has established the Heidelberg center for Personalized Oncology (DKFZ-HIPO), a dedicated genomics, proteomics and bioinformatics platform harboring the largest genome sequencing core in Germany (Illumina HiSeq X-Ten facility). Towards molecular stratification, the NCT MASTER (Molecularly Aided Stratification for Tumor Eradication) umbrella protocol provides a clinical implementation workflow for high-throughput diagnostics. Steps include: quality-assured sample acquisition; histopathological evaluation; quality-managed analyte extraction; NGS and other “omics” technologies; bioinformatic processing; GLP-certified validation of variants; and clinical evaluation by a molecular tumor board. NCT MASTER makes it possible to perform and evaluate molecular diagnostics on materials from all consenting NCT patients, with the explicit purpose of stratifying each patient for the best treatment or trial strategy. In order to best integrate and exploit the data produced in all NCT programs, a central NCT DataThereHouse contains a working copy of every patient-related dataset from all IT sources to enable efficient retrieval, aggregation, and evaluation of molecular and clinical data for clinical decision making and translational research. Multiple Clinical Cancer Programs with clinical and scientific excellence organize interdisciplinary patient care and form disease-oriented coordinated research programs that link NCT, DKFZ, and HUMS research groups with national and international research and clinical trial networks. Focus programs for neurooncology, gastrointestinal tumors, multiple myeloma, pediatric tumors, lung cancer, among others, use campus-wide high-quality scientific and technical platforms to advance the clinical translation of basic research into clinical application. The NCT Radiation Oncology Program has a strong link to all NCT Clinical Cancer Programs and provides a platform for the early development of new radiation oncology techniques (such as the Heidelberg Ion Therapy Unit (HIT)) towards precision oncology. Current trials include the Heidelberg-led INFORM study, which enrolls all children and adolescents with relapsed or refractory cancers in Germany for comprehensive molecular profiling. The NCT MASTER MATCH trial focuses on rare tumors and adult patients – at NCT and DKTK sites - with systemic cancers who are younger than 50 years. The NCT Neuro MASTER MATCH trial uses obligatory genome-wide methylation analyses and a glioma gene panel to treat newly diagnosed glioma as a paradigm for other entities. In addition to activities at the center, numerous model projects for precision oncology are moving forward in interaction with the German Consortium for Translational Cancer Research (DKTK), the National Cohort, and the Helmholtz initiative on Personalized Medicine (iMed). In line with the Cancer Core Europe consortium, it is NCT’s overall aim to provide optimal individualization of treatment decisions according to the specific needs of each individual patient by reaching across traditional disciplines and academic departments.